We all know how important glossaries are for making sure that a translation is accurate, and most of all, consistent. There are several tools for managing glossaries on the market, most of them stand-alone applications. 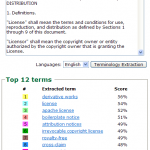 Terminology extraction is one important phase of glossary creation, during which the key terms for the glossary are selected. Until recently, this has been a lengthy process of hand-picking the most significant terms from the source documents. 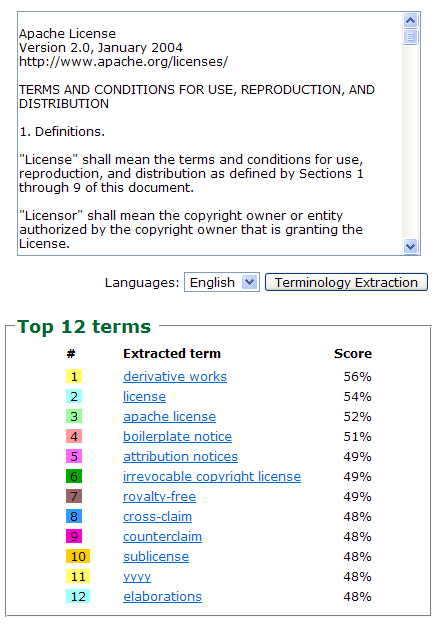 However, there are some automatic terminology extraction tools available. This is a simple, web-based tool that can be used from a browser. In this example, I have pasted the Apache 2.0 license into the field. The service created a list of 12 key terms. This process could be performed for creating a glossary before starting a new translation. Just paste the source text into the field, click on Terminology Extraction, copy the list of results into your favorite TEnT and translate the glossary before starting the actual translation work. This glossary could be saved as a term base and/or reference TM.